The FreeWheel(tm) Wheelchair Attachment is a durable, lightweight (under 5 lbs) product that quickly clamps to your existing rigid-frame wheelchair footrest and allows you to push over surfaces that would typically be impossible. With the FreeWheel you are ready to roll in seconds! 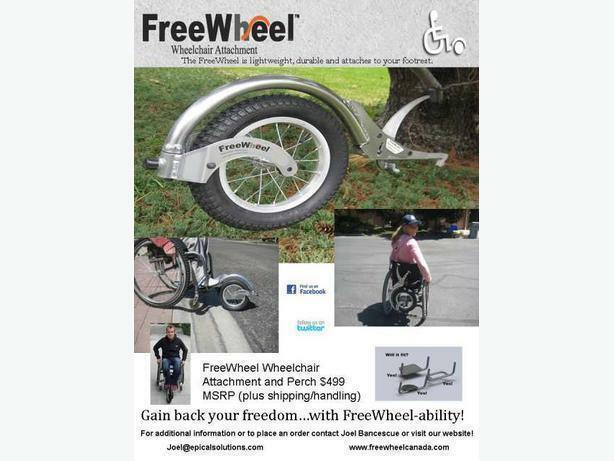 The FreeWheel Wheelchair Attachment is a new product that attaches to your existing wheelchair and allows you to push over surfaces that would typically be impossible! Made from strong, aircraft quality aluminum means your FreeWheel comes with a Satisfaction Guarantee. The overall unique curved design adds strength and means there are no sharp edges to catch on anyone or anything. The precisely engineered vise like connection allows you to confidentially attach your FreeWhee for a secure fit and excellent handling. The large front wheel has less resistance than small casters and makes it easier to roll on any surface, whether you are alone, or someone is helping you. This mechanism keeps the front wheel straight to improve stability and handling. By applying slight pressure, it will release, allowing you to quickly and easily turn in any direction. Attach the included perch onto your crossbar behind your seat back and clamp your FreeWheel onto it when you need to stow it. This allows you to have your FreeWheel literally at your finger tips and also, keeps it out of the way when you don't.